If we can be of more assistance at anytime, please contact us. Visits to our showroom: Are welcome by appointment only! Wednesday - Friday 10:00am - 3:30pm - Other times may be available by appointment. Note: Please call to verify in-store pricing and availability before visiting to make a purchase as our in-store prices and policies are not the same as this website. We have a simple shipping policy that will help you "Save on Shipping Costs". No Extra Charges for Shipping Heavy and Over sized Items unless stated specifically in the item description. Orders over $99.00 are shipped for FREE! Some items where the cost of shipping is just prohibitive due to a low cost and excessive weight. These items are notated in there description and the additional shipping amount will be noted as a pre-selected option. On Bulky and/or Over sized Orders that may need to be shipped by Truck Line/Common Carrier AS SPECIFIED. Orders that are shipped to a residential address (via common carrier only not UPS or FedEx small packages) are usually charged a residential surcharge by the freight carrier in the range of $50.00-$100.00 - however we have this fee WAIVED for the convenience to our customers. This is only pertaining to over sized/overweight items 151 Lbs or more. On large orders where a hydraulic lift gate is required to bring the item off the back of the truck, the charge is in the range of $75.00 - $125.00 for most companies - however we have this fee WAIVED for most customers as a convenience. There are certain areas that the this fee cannot be waived. Usually in rural California, Washington, Utah and Oregon areas. The lift gate is just an option and you are not required to get this option. You can also opt to have your shipment delivered to a commercial location or pick up at the carrier terminal. There will need to be someone there to unload the items from the truck. We use major freight companies and the person delivering your shipment is just a driver not an un-loader. We are happy to ship to these areas by UPS/FedEx Ground/Air, UPS/FedEx 2nd Day and Next Day Air shipping to most areas of Alaska, Hawaii and Puerto Rico. The shopping cart will calculate actual charges through the UPS system. We cannot ship to PO Boxes or APO/AE. For Puerto Rico - Please choose Puerto Rico as your Country at checkout to get an accurate rate. We are shipping most of our items via UPS Standard or UPS Worldwide Express service into most parts of Canada. Shipping charges are calculated directly from the UPS system. We cannot ship to PO Boxes or APO/AE. The Buyer is responsible for all taxes, duties, customs charges and broker fees. We will sometimes also be able to ship your order by USPS. This is determined by weight, how fragile the item is and the cost. 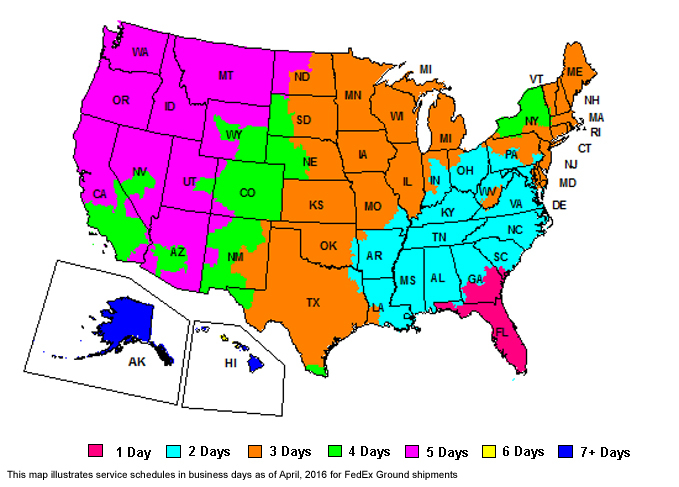 The Map shows the number of transit days (business days) for delivery via ground services to your state once your order has been shipped. We utilize a full range of shipping services to meet your various delivery needs, including Ground Services, 3 Day Select, 2nd Day Air and Next Day Air service. For example, you may expect shipments to Mississippi to take three to four working days while shipments to Washington State may take five to six working days. (Note that UPS and FedEx Ground and FedEx Express do not count Saturdays, Sundays, and some holidays as working days. FedEx Home Delivery delivers Tuesday - Saturday). Transit time to your location is color coded by Days required to reach you from our location. Transit time does not include weekends/ holidays. Please note: Map Reference: A business day does not include Saturdays, Sundays, or holidays. Please check the shipping and handling costs that the other firm charges and then compare prices. We only match the total delivered price at that company. Example 1: Buying 1 item at that site for $35.00 plus $13.00 shipping = $48.00 - That is the total delivered price. If the price is still lower than ours, let us know where you found the product, what the product is and the total price with shipping and tax if any (total delivered price). We unfortunately cannot match prices when the other site does not have stock. Since we pay the shipping on most orders over $99.00 and there is reduced shipping charges on orders under $99.00 you will see that our prices are very competitive. Price matching will only be done prior to the sale. Sorry but we cannot match prices after the sale is completed. Price matches are done at our discretion. We reserve the right to deny a price match due to prices that are lower than our cost or shipping that is too high in relation to our profit margin. We match most requests that are submitted to us however some just are not profitable. We are only registered to collect sales tax in the State of Florida - Sarasota County. We collect 7% Sales Tax for all Shipments that are destined to any Florida location. Sales tax is then passed to the State/County. There is one exception; if you are a business in the State of Florida and will be reselling the items you purchase, you can fax your current Sales Tax certificate to us fully completed. Signed and dated and we can waive the sales tax. This can only be done prior to the sale. We cannot go back and credit sales tax after the order is placed. We DO NOT collect tax on shipments going to any other state. Sales and Use tax is the responsibility of the buyer. Please check with your State's tax department. Credits are usually processed with 14 days of receipt of item however this can run longer in the peak of the pond season. If your item was used or is being returned in a condition different then when we shipped it out there will be a 30% restocking fee and the actual shipping and handling fees. Exchanges: When exchanging brand new items for another product, we follow the same policies outlined here but NO restocking fees when you wait for us to get the item back! Other options are available. Merchandise must be returned in the original brand new condition and sealed packaging as delivered to you. This means that the item is not opened or used (tested even for a few seconds) is resalable with all materials that the item came with including the original box and inserts and in the same condition that the item was shipped to you in. All returns must be sent to us at the senders expense. 123Ponds.com cannot incur shipping charges for returned packages unless the return is due to our error. Returned items must have a Return Authorization Number Clearly noted on the top of the box. Items that do not have this number will be refused at the senders expense. We cannot accept items that have been used excessively or abused in any manor. If the mistake was our fault then there are no restock fees and we pay the shipping both ways for a replacement of the same item only. These cannot be returned once used or placed into service. If your purchase is found to be defective or damaged within 3 days of arrival, please call us and let us know so that we can take care of it. After 3 days please look to your warranty information if applicable. Any damages incurred from packages shipped via UPS or FedEx will be claimed by us. Packages shipped by USPS will need to be claimed by the receiver. Please allow up to 30 days for processing. If an item is defective when received please contact us immediately and we will assist you in getting this corrected. We cannot give you your money back just because an item is defective, damaged or lost in transit. For your benefit, inspect all merchandise before signing or write on the bill of lading: "Not for Hidden Damages"
If the above is not written on the bill of lading, the carrier denies damage claims and we cannot be liable. All freight is our property until you sign for it or receive it. By signing or receiving you are accepting possession of the products and they are now your property. Residential deliveries are subject to signature at delivery. This can be due to value and or other factors and is for your safety and to ensure you receive your order safe and sound. If you will not be home during the day to receive a signature required package, then we suggest that you opt to have the package delivered to your place of business. Important Note: Signature Requirements cannot be removed once the item is in transit. If you do not waive the signature prior to the order�s departure, then you will be responsible for all shipping fees in the return and reshipment of your item.. Please make sure that your shipping address is 100% correct before submitting your order. UPS and FedEx both charge us an administrative fee if they need to correct your address. This means that you must add the ending of your address such as: Street, Road, Lane, Court, Avenue, Etc. and you must add an Apartment, Suite or Room number. Please don't assume that we will correct your address here or that they will fix it. This only delays your shipment and costs you money. If UPS or FedEx has to change your address even for something as simple as an Office or Apartment number they charge us $13.00 We will then charge this fee to you. If a package is returned to us for NON DELIVERY, you are responsible for the shipping charges back to your location and any other fees associated with the return. We cannot give you your money back on your purchase. Please know what you are ordering when you order and if you have any questions, please ask us before ordering. This is why we have a toll-free number. For orders that are refused you will be liable for the full cost of the products, shipping and handling charges and any applicable restock fees. We do not give refunds on refused orders. At our full discretion we may decide to take the item back. If we do take the items back they will have the same terms as our standard return policy. This is done at our discretion. We reserve the right to change pricing at anytime and without notice. We are not responsible for typographical errors or errors with photographs and will not be liable for misprinted information or obligated to sell an item at an advertised price. Information on our website is compiled from the manufacturers catalogs, websites and pull sheets. Photos and illustrations are used on items and can be similar but not exact representations of the item and sometimes change without our knowledge. If in doubt please contact us before purchasing, we are always happy to assist you. How do I find the item I want to order? To find a specific item, enter the name in the Search box at the top of the Shopping page. The Search box allows you to find a list of matching items. You can also browse through the Shop by Category Section at the bottom of every page for the shopping categories to find items that interest you. Try synonyms, related terms, or variant spellings. Use proper spacing between words. If your search term is too specific, try a term that is more general. Typically orders cannot be cancelled once the checkout process has been completed. Due to our commitment to process orders quickly, once the checkout process is completed our warehouse is immediately notified to pick and pack the order for shipment. We regret any inconvenience that this may cause you. Cancellation requests need to be submitted by e-mail. If there is time to cancel the order there will be a 10% surcharge for doing this as noted in the shopping cart at checkout and as you agreed to at checkout by selecting the Agree to terms and conditions box. Email to support@123ponds.com - Make sure you provide your order number and full name. To purchase items from our site, you need to place them in our electronic shopping cart. Simply click on the "Add to Cart" button on the item's product information page. You can continue adding items to your cart until you're ready to make your purchase. You can view the items you have placed in your shopping cart at any time by clicking on the "Shopping Cart" icon located at the top of any page. We are not liable for misuse or wrongful operation of any products that we sell. Instructions must be followed completely. A GFCI (Ground Fault Circuit Interrupter) device must be used with all pumps, lighting and electrical devices used in and around water. Pumps for outdoor use should only be purchased with a 3 Prong grounded cord. Thin cord 2 prong items should be limited to indoor use only. Submersible Pumps, lighting and other electrical equipment should not be used in or around a swimming pool and proper safety should always be followed. Use safety in and around ponds when small children are present. Do not assume they are safe. Always supervise children around ponds. When building your pond you should check with your local utilities for underground pipes, cable and power lines as well as your local zoning authorities for proper guidance. We are not liable for contractor's fees or for items not delivered "on time". Nobody should ever book a contractor or workers until all parts and materials are in there possession ready for the job. Warrantees are handled by the respective manufacturers. Although we are authorized distributors for the products that we sell we have chosen not too take products in for warranty repair or replacement. Please call us if you need to get the manufacturers information and/or a copy of your invoice. Little Giant, CalPump. Atlantic Water Gardens Brand products. For these three brands you will notify us within the warranty period and we will evaluate and handle the warranty per the manufacturer's guidelines and approval. For all CalPump, Little Giant and Atlantic Water Gardens products, We need to be called for a Return Authorization Number prior to receiving any returns for warranty. Warranties are handled by repair or replacement only of the same product unless that product is no longer manufacturered, in stock or suitable for the use they are used in at our discretion. Refund is not an option. By Purchasing from us you agree to the terms noted above even if you did not read this section before you ordered. This page is available from every page within our site including the checkout page. Please do not say that you did not read it so it does not apply. The policies written above are in effect for ALL ORDERS including Telephone, Fax, Mail and but not limited to Online Orders.